In our tutorial group we are looking at the Gospel readings for Sunday week. The readings in the Revised Common Lectionary for the Sunday after next, the Fifth Sunday in Lent [2 April 2017], are: Ezekiel: 37: 1-14; Psalm 130; Romans 8: 6-11; and John 11: 1-45. 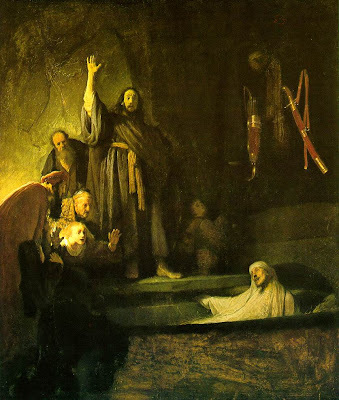 In the Gospel according to Saint John, the raising of Lazarus from the dead is the last and the greatest of the seven Signs performed by Christ. We also have here the fifth of the ‘I AM’ sayings: ‘I am the resurrection and the life. Those who believe in me, even though they die, will live’ (John 11: 25). The Raising of Lazarus is the crowning miracle or sign, revealing Christ as the giver of life and precipitating his death. But this sign is also the immediate cause of his death, for this is the sign that convinces the religious leaders in Jerusalem that they must get rid of Christ. And so, the raising of Lazarus from the dead by Christ is an appropriate Sign to recall as a prelude to Holy Week, as we prepare for the climax of Lent and to mark the death and resurrection of Christ. The Saturday after this reading – the Saturday before Palm Sunday – is known traditionally in the Orthodox Church as Lazarus Saturday, and the appointed Gospel reading is this reading, John 11: 1-45. In the Orthodox Church, Lazarus Saturday and Palm Sunday together hold a unique position as days of joy and triumph coming between the penitence of Great Lent and the mourning of Holy Week. The theme of the raising of Lazarus dominates all Orthodox services on Lazarus Saturday, while at the same time looking forward to Christ’s resurrection on Easter Day. 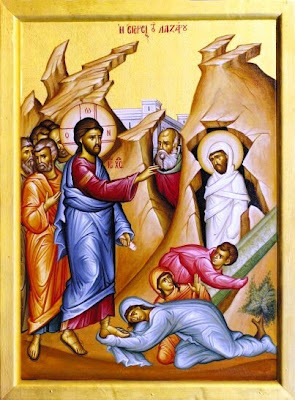 The scripture readings and hymns for Lazarus Saturday focus on the raising of Lazarus as a foreshadowing of the Resurrection of Christ and as a promise of the General Resurrection. A number of the hymns, written in the first or second person, symbolically relate the death, burial and shroud of Lazarus to one’s own sinful state. Many of the hymns with Resurrection themes in a normal Sunday service that are omitted on Palm Sunday are chanted today on Lazarus Saturday. Many Orthodox people abstain from meat and dairy products on Lazarus Saturday, although wine and oil are allowed, and special spice breads called Lazarakia are made in Greece and eaten. In Greece, it is a custom on Lazarus Saturday to make elaborate crosses out of palm leaves or olive branches that are then used the next day, Palm Sunday. that bring profit to our soul. O Lord, glory be to you. During the Divine Liturgy, the baptismal hymn, ‘As many as have been baptised into Christ have put on Christ’ (Romans 6: 3) is sung in place of the Trisagion. This may indicate that this was at one time a day traditionally for baptisms. This story is well-known because it once contained the shortest verse in the Bible: Jesus wept (John 11: 35, AV). Jesus loved Lazarus, who had died in Bethany. When Jesus arrives in Bethany, he finds Lazarus has been dead four days. 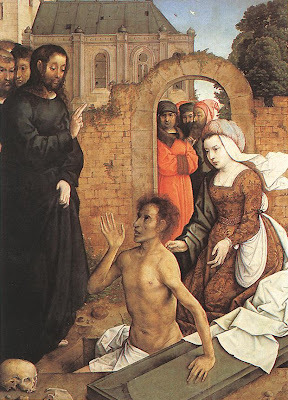 Jesus comes to his tomb, and despite the objections of Martha, he has the stone rolled away, prays, and calls on Lazarus to come out. This Lazarus does, wrapped in his grave clothes. 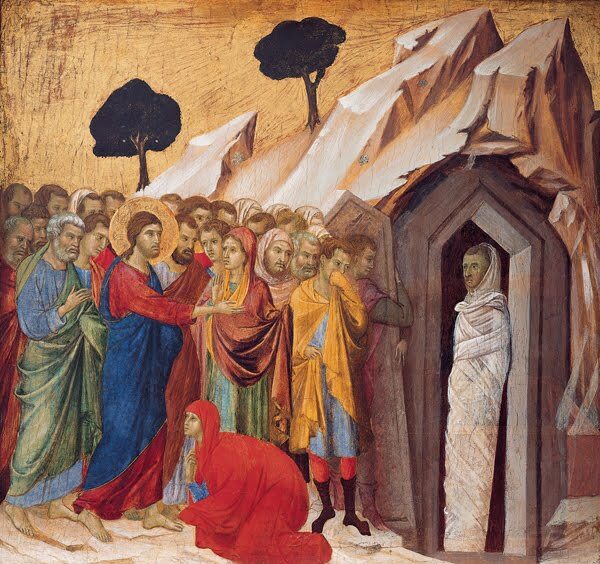 The Raising of Lazarus illustrates the two natures of Christ: his humanity in weeping at the death of his friend and in asking: ‘Where have you laid him?’ (John 11: 35); and his divinity in commanding Lazarus to come forth from the dead (John 11: 43). The name Lazarus means ‘God helps,’ the Greek Λάζαρος (Lazaros) being derived from the Hebrew Eleazar, ‘God’s assistance,’ or ‘God has helped.’ So, already the name of the principal character in the story introduces us to expectations of God’s actions. Notice that when the news comes to Jesus, it is brought with no specific request to come or to act. His reply is enigmatic, but he is not saying that the life of Lazarus is not in danger, for he knows already that Lazarus has died (see verses 11, 14). Note the comparison between physical death, which is inescapable, and spiritual death, which comes by choice. Note the tenderness here that counters any harsh interpretation of the words in verse 4 – Jesus loves Mary, and Martha, and Lazarus. Christ does not delay going to Bethany out of callous disregard for the plight of Mary and Martha. What he is going to do is not as a reaction, but on his own initiative. Jesus ought to be seen as proactive rather than reactive. 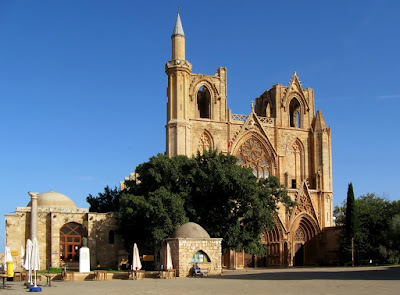 Here again we have the contrast between light and dark, a Johannine theme we encountered in recent weeks in the lectionary readings, for example, about Nicodemus and the blind mean healed at the pool of Siloam. ‘Asleep’ is a common term in the New Testament for death (see Matthew 9: 24; Mark 5: 39; Acts 7: 60). Once again we come across the Johannine theme relating seeing and believing. Contrast Thomas’s apparent faith at this point, with his refusal to believe until he sees for himself after the Resurrection. Here, as in Luke, Martha is the active sister, while Mary is the contemplative member of the household in Bethany (see Luke 10: 38-42). Martha has moved beyond personal interest in seeking for her brother; now she moves beyond even that wider but limited circle of want and need to accepting what God wills. Death is not the end. But I am reminded of how Archbishop Desmond Tutu used to say that there are things that are worse than death for a Christian … including the loss of values, commitment and faith. This the fifth of the ‘I AM’ sayings in this Gospel: ‘I am the resurrection and the life. Those who believe in me, even though they die, will live’ (John 11: 25). After that, the title ‘the Teacher’ appears to be quite a mundane title for Martha to use. Yet this is also the title Mary Magdalene uses at the tomb on Easter morning (John 20: 16). So can we draw parallels between what is happening at this grave, and what we can expect two weeks later on Easter Day? Jesus asks: ‘Where have you laid him?’ This is precisely the same phrase used by the women when they arrive at the empty tomb on Easter morning (John 20: 2), and when Mary approaches Jesus in the garden (John 20: 13). Do you think the four words here lose the literary impact on the King James Version; ‘Jesus wept’? Of course, the word used for Jesus weeping is not the same word used to describe formal weeping at a Jewish funeral. It means to shed tears, and indicates that Jesus is not just formally acknowledging the death of his friend, but is sharing in the human emotions of grief and sorrow. The Raising of Lazarus illustrates the two natures of Christ: first his humanity is revealed in his weeping at the death of his friend and in asking: ‘Where have you laid him?’ (John 11: 35). Popular belief at the time accepted that the soul lingered near the body for three days. So on the fourth day Lazarus was truly dead, and all that remained in the grave was a corpse. Lifting up his eyes is a prayerful action in itself, and that combined with his giving thanks to the Father has action and words that convey Eucharistic resonances. The Raising of Lazarus illustrates the two natures of Christ: here we find his divinity in his commanding Lazarus to come forth from the dead. In his death, Christ breaks through the barriers of time and space, bringing life those who are dead. Those who hear the voice of Christ live. But Eliot is referring to the other Lazarus in the Gospel stories: Lazarus who each day sat begging outside the gate of a rich man, his sores being licked by the dogs, while inside Dives, dressed in fine clothing, is dining sumptuously each day (Luke 16: 19-31). Both men die, but Dives would like Lazarus to come back to life. But despite what Eliot says and Dives hopes, this Lazarus does not come back from the dead once he has been received into Abraham’s Bosom at the heavenly banquet. For his part, the rich man craves merely a drop of water from Lazarus’ finger to cool his tongue, for he is tormented by fire, and wants Lazarus to return and warn his wayward brothers. This Lazarus is the only character in a New Testament parable with a name. The rich man has been named Dives by tradition, but in the telling of the story he has no name: in effect, he has lost his name, and with it his human identity. Death comes to us all. We all end in the grave. No miracles, no wishing, no praying, can take away that inevitability. Dives learns – when it is too late – what it is to be human, and that we do not come back from the grave. This Lazarus was rewarded, not because he was poor, but for his virtuous acceptance of poverty. The rich man was punished, not because he was rich, but for his persistent neglect of the opportunities his wealth gave him. Christ in his life points us to what it is to be truly human. In the grave, he proves he is truly human. He has died. He is dead. Unlike Lazarus the beggar, he can bridge the gap between earth and heaven, even between hell and heaven. But like Lazarus of Bethany, he too is raised from death not by human power but by the power of God. There is no further mention of Lazarus of Bethany in the Bible. So what happened to the tomb of Lazarus in Bethany? And what happened to Lazarus himself? An interesting piece of music to play for reflecting on the story of the raising of Lazarus is by Paul Spicer. 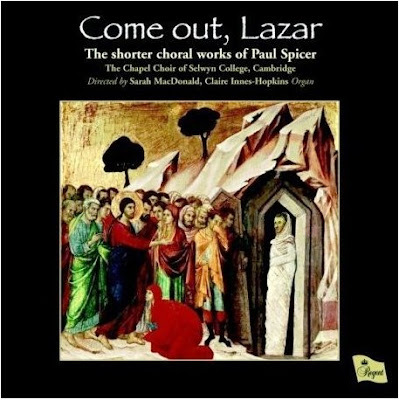 Come out, Lazar is the title track (7’24”) on a recording made eight years ago of the shorter choral works of this English choral conductor by the Chapel Choir of Selwyn College, Cambridge, directed by Sarah MacDonald, with Claire Innes-Hopkins on the organ (Regent Records, 2009, total playing time: 63’59”). Paul Spicer began his musical training as a chorister at New College, Oxford. He studied with Herbert Howells and Richard Popplewell (organ) at the Royal College of Music in London, winning the Walford Davies Organ Prize in his final year. He now conducts the Chamber Choirs at the Royal College of Music in London, and the Birmingham Conservatoire, and is Professor of Choral Conducting at both institutions. I first came across his work in Lichfield, where he has lived in The Close since 1990, and he was Artistic Director of the Lichfield International Arts Festival for 11 years. His Easter Oratorio was commissioned for performance in Lichfield Cathedral in 2000, and the libretto was written by his close friend, the then Dean of Lichfield Cathedral, Tom Wright, to mark the 1300th anniversary of Lichfield Cathedral. The Independent described it as ‘almost operatic in its inherent drama’ and as being ‘a major contribution to the choral society repertoire.’ He remains a member of the Council of Lichfield Cathedral. The anthem Come out, Lazar is the most substantial work on the 2009 recording by the Chapel Choir of Selwyn College. It is a dramatic, and almost apocalyptic, setting for mediaeval poetry, in this case an anonymous 14th century English text. It was commissioned by Ralph Allwood in 1984 for a BBC Radio 3 broadcast by the Uppingham Choral Course. The anthem is basically in an ABACA form, with the B and C sections being reflective. It takes every opportunity to use the words descriptively. The final triumphant section (‘For with that word he won the field …’) builds up to a huge climax on the word ‘might,’ and the final page keeps the excitement building to the end. Come out, Lazaro, what so befall. Longer make that soule to dwell. To that feloun, our enemy. Come out! it said, be not aghast. As doth the leaf when windes wake. And all his careful [wretched] company. For it has broken the prison strong. That wroughten wretched soules woe. It maketh the devil and death to flee. Is not ‘Come out!’ an asper cry? For it gan helle soon [at once] t’assail. Why stoppest thou not, fiend, thine ear? That this word enter not there? That were enholden there with wrong. Tell now, tyrant, where is thy might? ‘Come out!’ hath felled it all with fight. The final triumphant section (‘For with that word he won the field …’) builds up to a huge climax on the word ‘might,’ and the final page keeps the excitement building to the end. 10 shop him felly to the fight: advanced valiantly to battle. 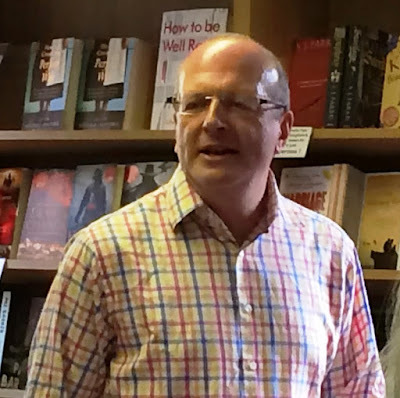 (Revd Canon Professor) Patrick Comerford is Lecturer in Anglicanism, Liturgy and Church History, the Church of Ireland Theological Institute, Dublin. This essay is based on notes prepared for a Bible study in tutorial group with MTh students on 22 March 2017. Pray that we might learn how to be disciples in communities where people of many faiths, backgrounds and beliefs are neighbours. Pray that we might learn tolerance..